Unleashthespirit, now called Rosie, was in her forever home on New Year"s Day! 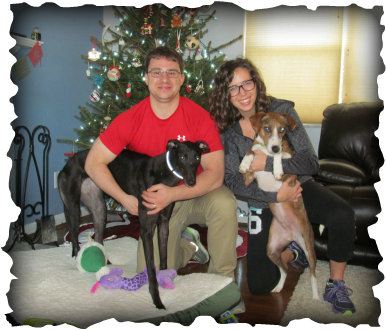 This family wanted a greyhound to be a friend with Willow their sweet little whippet/besinji mix. When they met for the first time, Spirit was all about playing and Willow needed a little less enthusiasm but after a short period of time they did fine, and soon I am sure they'll be good friends. Spirit's new home is in the Kenwood area with a huge back yard and lots of new toys to call her own. She will really enjoy her new life.